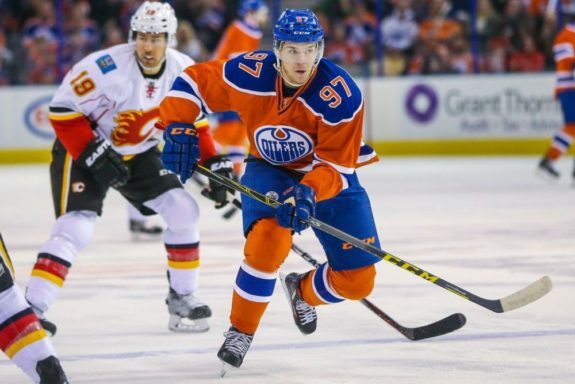 With the Edmonton Oilers officially announcing the signing of Connor McDavid to an eight-year extension yesterday afternoon, the sole focus of Oil Country has now shifted to the immediate future of one Leon Draisaitl. At 21-years of age and coming off a season in which he became a top ten scorer and outperformed his aforementioned linemate during the NHL playoffs, the youngster could not have picked a better time to become a restricted free agent. The question now becomes how can the player and organization make this work? Now that we can move on from Connor's new deal, the summer becomes all about Draisaitl! At this stage in his career, Draisaitl has just begun to scratch the surface on the kind of player he might become and the future looks awfully bright. The kid has gone from being put in an awfully tough spot by his head coach during his rookie campaign, hello Dallas Eakins, to a player who had the good fortune of seeing a ton of time alongside one of Taylor Hall or McDavid over the last two seasons. To his credit, he made the most of the opportunity and his results speak for themselves. 48 goals, 128 points in 154 games is hard to ignore and nor should they be. For those suggesting he has been riding the coattails of a pair of extremely talented linemates, is not only a stretch but not fair in any way, shape or form. In his defence, let’s not forget the reason why Draisaitl was used to the extent he was with McDavid in 2016-17. No other player on the roster proved capable of producing in the spot on a consistent basis and the chemistry which formed between the two was rather obvious. Edmonton Oilers center Leon Draisaitl (29) during the NHL game between the Edmonton Oilers and the Carolina Hurricanes at the PNC Arena. Though we are talking about an extremely limited sample size, the talented German showed during the Oilers second round playoff series against the Anaheim Ducks he was capable of driving his own line. And in all likelihood, Draisaitl would have done far more of it during the regular season had Edmonton found No. 97 a running mate. With that said, there is no question he benefited from playing alongside McDavid and the club was better off for it. However, the trick now becomes how is this going to work from a financial standpoint. With the team captain and, in my mind, best player in the league just inking a deal that will see him earn $12.5M on an annual basis starting in 2018-19, figuring out where Draisaitl fits into the equation is Peter Chiarelli’s next project. According to the whispers currently making the rounds, his agent is looking for somewhere in the neighbourhood of $9M -$10M for his client. On the surface, it seems like a rather lofty ask for a restricted free agent with only a season and a half worth of high-end production on his resume. Yet, with many of the game’s top young players signing massive extensions coming off their entry-level deal becoming the norm, perhaps it’s not as far-fetched as some think. Right or wrong, if the Oilers hope to sign Draisaitl to deal similar in length to what they did with McDavid…it is going to cost them. Could the recent signing of Washington Capitals centre Evgeny Kuznetsov to an eight-year/$62 million deal be used as a comparable? For sure it could but there are differences to consider…most notably age. There is a three and a half-year difference between the two and the deal Kuznetzov signed will take him to the age of 33. Chances are the gifted Russian isn’t far off reaching his ceiling as a player, whereas Draisaitl doesn’t turn 22 until October and could “potentially” have far more to give. 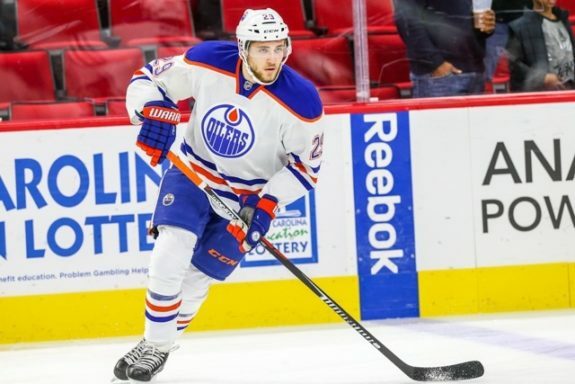 With that being the case and considering the opportunity that will exist in Edmonton for him to put up some big numbers, it wasn’t overly surprising that the apparent ask was much higher from the Draisaitl camp. Another thing to consider, while both were first round picks the Oilers used the third overall selection in 2014 Draft on the former Prince Albert Raiders standout and he has delivered to this point in his career. Players who are selected in that area of a draft and produce during their first three years, tend to get paid a bit more when it comes to their next contract. Now does that mean Kuznetsov isn’t a good comparable? Hardly but the two situations are not exactly the same. Though when you look at it from the Oilers perspective, committing that much term and money is tough to do with the McDavid deal already on the books…not to mention the ugly contracts of Milan Lucic and Kris Russell. In other words, a bridge deal would be a best case scenario for the organization and actually not a bad bet for the player. It worked out just fine for P.K. Subban when he and the Montreal Canadiens agreed on a two-year deal that paid him $2.875 million a season and was promptly turned into an eight-year/$72 million extension. If the general manager and Draisaitl could come to an agreement on a two or three-year contract in the $5M-$6M range, would it not be advantageous to both sides? This way Chiarelli can make additions to the current roster in hopes of putting this group over the top and give them a legitimate shot at winning a Stanley Cup in the next year or two. If the Oilers do that, you can bet Leon Draisaitl will get his massive payday, be it from Edmonton or somewhere else, and won’t be forced into a predicament where he threatens a holdout…a situation which usually hurts both the player and team. It’s all well and good that a player wants “X” amount of money but the fact of the matter is the club holds all the cards in the here and now. Unless the two sides can agree to the aforementioned Kuznetsov style deal, which seems highly unlikely, there is no reason for Peter Chiarelli to do anything other than sit and wait.